Mighty Molar®, the SuperHero of Smiles®, is at your service as an advocate for children and families' overall health and wellness. 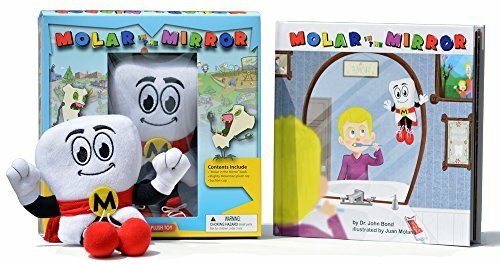 In the book, "Molar in the Mirror", he is introduced as a dental health superhero, and loves hanging out with his friends. He has even had a song written about him... "The Mighty MolarMan Song"®. Mighty Molar® has well-rounded interests including sports, outdoors activities, music, creative writing, health & fitness, leadership and even cooking... there's not much that he won't try that is rooted (hehe) in fun, and good health. Mighty Molar® has been known to collaborate with Coach Jack Fundy and other coaches to improve safety for kids in youth athletics. He also works with Canine as advocates for pets' good oral health and overall well-being. You could say that Mighty Molar® is a Molar on a Mission... ready and eager to help children/families out in any way that he can. Mighty Molar® is Tooth Fairy endorsed, and ready for action... and he often battles with Dr D. K®., Bacteria Boy®, and CandyMan®. Finally, Mighty Molar® has a real passion for helping the millions of children who suffer from dental phobias, and those with special needs, overcome their fear and anxiety to get the dental care they need. He is leading the way to help these kids... and appreciates all the Molar Maniacs out there who are helping too.